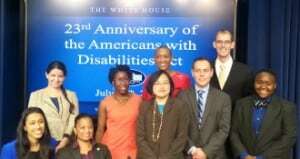 Today at the White House, the disability community came together to celebrate the 23rd anniversary of the Americans with Disabilities Act. At the celebration, 8 Champions of Change, representing the next generation of leaders in the Disability Rights movement, were named and honored. The Autistic Self Advocacy Network is proud to say that two of our own, Zoe Gross and Lydia Brown, were among those honored. Zoe Gross, a former ASAN intern and current coordinator of the Day of Mourning vigils, spoke of, among other topics, her work on the Day of Mourning and how the ways society devalues disabled people leads to unspeakable acts of violence and murder. As she ended, imploring people to recognize that our lives are not tragedies, but our deaths are, the crowd erupted into applause. Lydia Brown, an ASAN project assistant, focused part of her time on the extensive work she has done to help close the Judge Rotenberg Center in Massachusetts. She spoke of the atrocities that occur within those walls, the deaths of individuals who were placed in the JRC, and how abuse and torture are often considered “acceptable” in the name of treatment. Zoe and Lydia embody the strength and determination of the Autistic community. We congratulate them on their success and offer our whole-hearted support to the leaders of tomorrow! 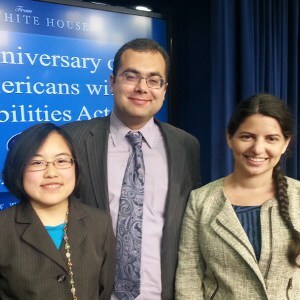 This entry was posted in Disability Rights and Neurodiversity, News, Self Advocacy and Representation and tagged Americans with Disabilities Act, autistic community, aversives and Judge Rotenberg Center, disability, growing up, representation. Bookmark the permalink.